1 November 2018 | As the airline industry has always captured people’s imagination, airlines can tap into their country’s heritage to incorporate a bit of storytelling into the passenger experience. Legacy carriers in particular can benefit from their ‘flag carrier’ status to differentiate from cheap and cheerful low-cost airlines. Going local provides airlines – and their countries of origin – with a ‘soft power’ tool to showcase their national heritage and offer passengers a way to experience local culture onboard – even when they are only flying the airline to transit to a third country. This also resonates with consumer trends such as authenticity, storytelling and the rediscovery of national and regional identities in a rapidly globalized world. Airlines that are doing a good job in this perspective are Finnair, Icelandair, SWISS, Hawaiian, Etihad, Air New Zealand and China Airlines. For more on this ‘branded experience’ topic, see this excellent article by Marisa Garcia. In 2014, China Airlines launched its ‘NexGen’ program with a design team led by Taiwanese designer Ray Chen. For example, the cabin walls and seats of China Airlines’ B777-300s and A350s are decorated with finishes of persimmon wood grains, as well as the table surfaces of the seats in Business. Persimmon is an edible fruit whose tree is symbolic to good wishes. 30 August 2018 | Philippine Airlines’ A350 – featuring a brand new cabin product – will soon start flying on its long-haul city pairing of Manila to London Heathrow. The lighting system onboard might not have taken the limelight, but it certainly creates it, designed as part of a truly holistic cabin concept. It is true that in many cabin design programs, mood lighting is often considered after the rest of the trim and finish is in place due to the still-siloed approach to the passenger experience. “In the case of the PAL A350, the robust lighting system gave us the ability to make mood lighting an integral part of the onboard experience, with distinct scenes designed around country, culture and brand. We aimed for a new level of differentiation, a new emotional connection,” says Baron. 11 November 2017 | Finnair has been the first European airline to take delivery of the A350-900 and the third carrier worldwide (after Qatar Airways and Vietnam Airlines). Finnair’s 297-seat aircraft is configured in three classes with 208 seats in Economy, 43 in Economy Comfort and 46 in Business. There is a lot to like about Finnair’s (and its design agency dSign Vertti Kivi & Co) approach towards designing the A350 onboard experience, which features several innovative elements. On most widebody aircraft passengers enter the cabin at the so-called door 2 and often their first impression is the sights of an industrial-looking galley area. Finnair has come up with a clever (and economic) solution by installing galley screens that are lowered when passengers are boarding and which feature a striking photo. A remarkable feature of the cabin is the dynamic mood LED lighting. When passengers board the plane, they are greeted by the sight of clouds drifting across a blue sky throughout the cabin (video), while cool Nordic blue shades resembling the Northern lights will set the mood as the plane approaches Helsinki. 20 April 2017 | While Business Class passengers have become used to full-flat beds, those who travel in Economy have had little to get excited about in recent times. As airlines seek to increase cabin density, many Economy passengers have seen comfort levels at best stagnate, and at worst decrease. In-flight entertainment developments and the ongoing rollout of onboard Wi-Fi are at least helping to provide welcome distraction, but if shoulders are rubbing and legroom is limited, the Economy Class experience is unlikely to be remembered with fondness. At the heart of the discussion about Economy Class comfort is the seat itself. Surely, if passengers have a comfortable seat, they will have a more enjoyable flight. With this simple premise in mind, FTE at the recent Aircraft Interiors Expo 2017 in Hamburg spoke to a number of aircraft seat designers and manufacturers to learn about their efforts to increase comfort across the board. For example, recently we have seen several initiatives that aim to increase the popularity of the dreaded middle seat. Bombardier’s C Series aircraft (currently operated by SWISS and airBaltic) features a 3-2 configuration, with a slightly wider middle seat (19 inch vs 18.5 inches for the window and aisle seats). 10 April 2017 | Moving beyond the low hanging – and very profitable – ancillary fruit of checked bags, advance seat reservations, extra legroom seats and last-minute upgrades, airlines are becoming more creative in generating revenues beyond just the ticket fare. One way to approach ancillary innovation is to look at the different needs passengers travelling in the same class may have. For example, SWISS has recently introduced a fee to pre-reserve one of the popular solo business class seats on its A330 and B777-300ER aircraft. In Economy, airlines are increasingly offering passengers options for more comfort at a time when seat density is increasing and load factors are high. South Korean low-cost carrier Jeju Air – which flies between South Korea and Japan, China, Taiwan, Guam, Saipan, The Phillipines, and Bangkok with a fleet of 26 single class B737-800s – has come up with a clever, hands-on, way to generate last-minute ancillary income, low-cost style. About two years ago, Jeju Air introduced a ‘Side Seat’ offer, which is similar to OptionTown’s ‘Empty Seat Option’ (adopted by airlines such as AirAsia X, Vietnam Airlines and Spicejet), and lets travellers purchase one or two seats next to their own seat, in an effort to sell last-minute seat inventory. Whereas the Empty Seat Option lets passengers purchase an option to a possible empty seat for a small fee and be notified if an empty seat is available 1 to 3 days before their flight, Jeju Air’s passengers can only book the additional seats at their departure airport on the day of the travel (up to 1 hour before boarding). 2 November 2016 | Aeromexico has taken delivery of it’s new Boeing 787-9 and with it, a brand new Classe Premier product designed for the long-haul routes the aircraft will fly. Adorned with the Quetzalcoatl one-off livery, the aircraft will surprise its passengers both outside and now inside too. With the airline currently offering a 2 x 2 x 2 configuration on the current 787-8’s that Aeromexico fly, this new cabin is a giant leap ahead in passenger comfort and space. The new seats now are configured in a 1 x 2 x 1 configuration with every passenger now receiving aisle access, a first for the Mexican carrier. The 36 seats by B/E Aerospace have been upgraded from the side-by-side Diamond range to the new Super Diamond range, which offer increased passenger space and privacy, similar to those found on Qatar Airways 787s and feature 18inch touchscreen hi-def screens and also now live TV channels. As well as a large spacious business class cabin, the entrance way at Door 2 has been completely redesigned by New Territory, spearheaded by Luke Miles, the same creative director that reimagined much of Virgin Atlantic’s inflight product over the last decade. So it is no surprise to see a communal walk-up bar space re-emerge on this aircraft. 26 August 2016 | When airlines such as Qatar Airways have announced recently they are working on brand new Business Class seats and Emirates is working on new First Class suites, it was a surprising twist to see Delta, a US carrier, to leap-frog the Gulf-based competition with an adapted Thomson Aero Seating product by UK-based design agency Factorydesign. The new Delta One Suite is the first Business Class cabin in the world to feature a sliding door for each suite – a feature normally saved for First Class passengers. The doors are a key part of Delta and Factorydesign’s collaborative efforts to improve customer comfort and privacy. The industrial design consultancy worked in close partnership with Delta and seat manufacturer Thompson Aero Seating throughout the design, development and engineering process to achieve this. 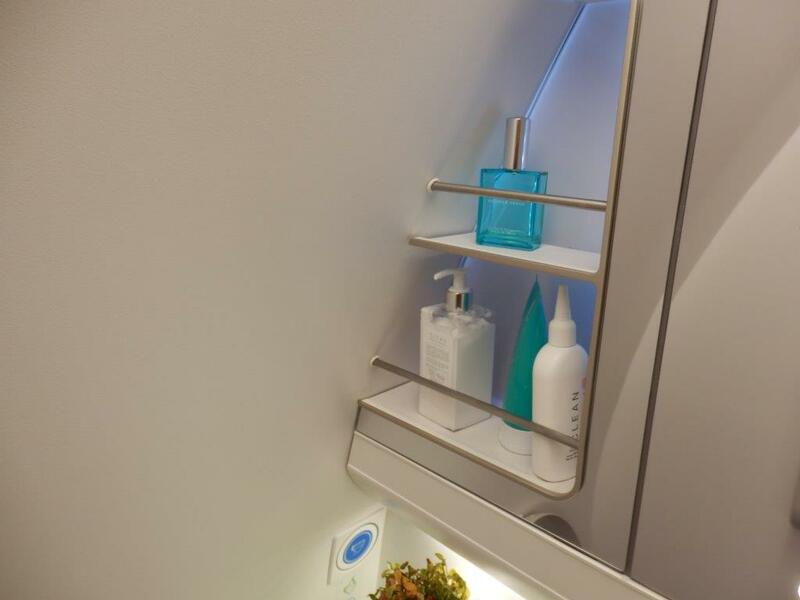 The word “cabin” is important in this announcement, as JetBlue’s Mint product offers 4 mini-suites on their aircraft featuring sliding doors, however, the rest of the seats don’t offer this level of privacy. The seat may look familiar, and follows the traditional 1 x 2 x 1 staggered forward facing design that Delta has already adopted in many of its long-haul aircraft. In fact the product has more in common with SAS’ new Thomson Vantage XL seats that the London based design firm also worked on. 20 August 2016 | Aircraft manufacturers are creating new passenger-friendly cabin environments by re-thinking the fuselage structure and introducing more spacious cabins with larger windows and improved cabin pressurisation, among other innovations. Boeing’s 787 Dreamliner and Airbus’ A350 cabins, as well as Airbus’ new AirSpace cabin exemplify this new design thinking for widebody aircraft. On narrowbody aircraft, Boeing’s SkyInterior cabin delivers cabin improvements, as does Zodiac Aerospace’s ISIS (Innovative Space Interior System) cabin featured on Delta’s A320-family aircraft. Now these cabin improvements found on Boeing and Airbus aircraft are coming to regional aircraft with Bombardier’s new CSeries regional jet. In mid-July, the first CSeries 100 aircraft entered service with launch customer SWISS, and won the hearts of passengers and industry watchers alike. The CSeries aircraft contains a high usage of composite materials, is quieter, features larger windows, and the cabin features large, rotating overhead storage bins, allowing each passenger to stow a sizeable carry-on bag overhead. 13 April 2016 | At last week’s Aircraft Interiors Expo (AIX) in Hamburg many of the innovations on display centered around passenger experience themes such as connected and empowered passengers, IFE&C as open platforms, further optimized Economy seat designs, mood lighting on steroids, and immersive Business Class seats. Good overviews of the specific innovations featured at the Expo can be found here (FlightGlobal), here (APEX), here (RGN), and here (Future Travel Experience). We’d like to single out one smart design concept that is an indication of how the industry continues to take existing innovations to the next level. Case in point: Geven’s Piuma Sofa seat, which will make its debut onboard an airline’s A330 later this year. Back in 2010, Air New Zealand surprised the airline industry with its innovative SkyCouch, a row of three standard economy seats that can be changed into a single, horizontal space by removing arm rests. The seats have large flip-up cushions that fill the space between the end of the seat and the next row of seats. Two other airlines – China Airlines (Family Couch) and Brazil’s Azul (SkySofa) – have licensed Air New Zealand’s SkyCouch design so far, while Air Astana came up with its own ‘Sleeper Class’ service. At this year’s AIX, Italian seat manufacturer Geven unveiled a working prototype of a further evolution of the ‘SkyCouch’ design, the Piuma Sofa. 9 March 2016 | In the past 20 months, Ryanair has been busy upgrading its products and services, stepping up its digital innovation activities, as well as opening routes to main airport hubs in an effort to appeal more to business travellers. Now, in a surprise move, Ryanair has taken its drive upmarket to a whole new level by launching a corporate jet service, using a customized Boeing 737-700 which is available for corporate or group hire. The B737-700 features 60 reclining leather Business Class-style configured in 15 rows in a 2-2 with a 48-inch seat pitch and include “fine dining catering facilities.” The Business-only 737 will be staffed by Ryanair pilots and cabin crew and has a range of up to six hours, making it “ideal for private corporate, sports team or group travel”, Ryanair said. Ryanair’s standard B737-800 aircraft feature 189 seats in a 3-3 layout. The Irish low cost airline says it has been attracting more business people since overhauling its model in the wake of two profit warnings in 2013. As it already caters for around 25 million business travellers per year and has now set up a dedicated corporate jet team at its home base in Dublin. A spokesman said the plane can be hired by the hour, with the “competitive” rate depending on the arrival and departure airports. According to The Guardian, a 60 seater private jet from London to Geneva would cost about £33,000 – or £550 a head – for a return trip. While, Ryanair is the first low-cost carrier to launch a corporate jet charter, airlines such as Korean Air (16 or 28-seat 737 Business Jet), Emirates (19-seat A319 Executive Jet) and Qatar Airways (40-seat A319 Premium One) offer similar charter services using a Boeing 737 or an A320 family aircraft, although these feature a more ‘uber-premium’ cabin. 8 February 2016 | In a time when the personal device (smartphone, tablet) is becoming the digital controller of just about every surrounding device (think Sonos, Google Chromecast, or Philips Hue), Panasonic’s new Waterfront concept seat – unveiled at last month’s Consumer Electronics Show in Las Vegas – demonstrates ‘the art of possible’ when the personal devices gets integrated with the aircraft seat. The Waterfront seat is the result of a partnership between Panasonic, B/E Aerospace, Formation Design Group and TEAGUE and follows last year’s JAZZ IFE/seat Economy concept. According to Panasonic, the objective with the new seat is to “take care of a passenger’s wellbeing in a more holistic way.” Using B/E Aerospace’s Super Diamond seat as platform, the Waterfront seat features a full privacy door, which “gives a First-Class feel within the confines of a Business Class footprint,” as RGN puts it. Other features of the Waterfront include customizable LED lighting (the interface has been coupled to hundreds of individually controllable full spectrum LEDs across the entire seat) and climate controls that adjust the temperature in the suite. Passengers can recharge their devices using one of the AC and USB ports or just place it on a wireless inductive charging panel. The centerpiece of the Waterfront suite though is a 24-inch high-definition 4K touchscreen monitor placed in a seamless edge-to-edge glass structure, which can connect to a passenger’s smartphone app. According to Australian Business Traveler passengers will be able to control the in-flight entertainment system AND the suite’s environment from their phone or from a supplied 7″ tablet. 2 February 2016 | SWISS just took delivery of its first new B777-300ER aircraft. 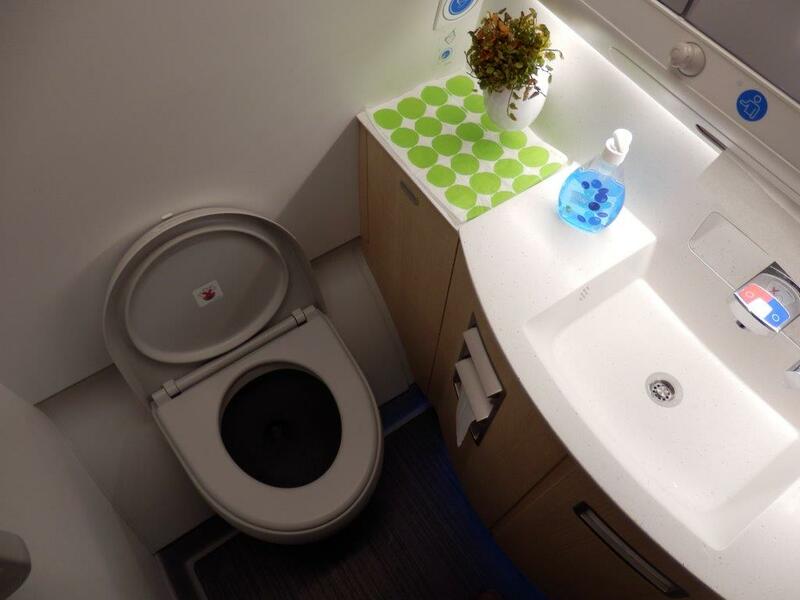 One of the things we like about SWISS’ new flagship interior is the creative touch that the airline and design agency Priestmangoode have added to the galley areas. On most widebody aircraft, the first impressions passengers get when entering the aircraft at the so-called ‘door 2’ is the sight of an industrial-looking galley area. In an effort to create a more welcoming environment, a growing number of airlines are adding design touches to this door 2 area. Recent examples include Finnair, which for its new A350s has come up with a clever (and economic) solution by installing galley screens that are lowered when passengers are boarding and which feature a striking photo of Finland’s nature. On the other end, Etihad has gone all out with the creation of a ‘welcome lobby’ on its A380s, which features dark wood fretwork panels, screens and doors and recreates the feeling of entering a boutique hotel. 28 January 2016 | JetBlue has announced a major A320 cabin restyling, which will include the introduction of what it calls a “fully connected in-seat experience.” New 10-inch, high-definition, Internet-enabled in-flight entertainment (IFE) screens, more than 100 live television channels and in-seat power outlets and USB ports are among the key features. JetBlue becomes the first airline to sign up for the new streaming television IFE system from Thales – called STV+ – which is built on the Google Android platform. The carrier said in a release this opens “unlimited possibilities for custom app and widget development, live content streaming, audio-and-video-on-demand, and personal device pairing.” In addition, the IFE system offers access to content stored locally on the aircraft. The new IFE experience represents a major upgrade to the existing standard-definition, 5.6-inch screens and 36 channels of live DirecTV that can currently be found on JetBlue’s A320s. Passengers will also have gate-to-gate access to the Fly-Fi connectivity service, meaning they can browse the Web and even stream movies on Amazon Prime before and during take-off and after landing.